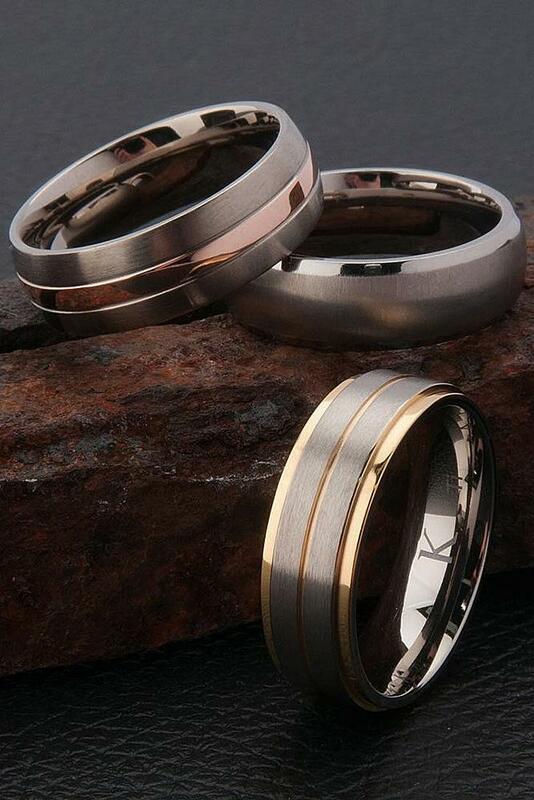 If you want a trendy and modern wedding band, take a look at tungsten wedding bands. They are one of the latest wedding trends for men, and for a good reason! 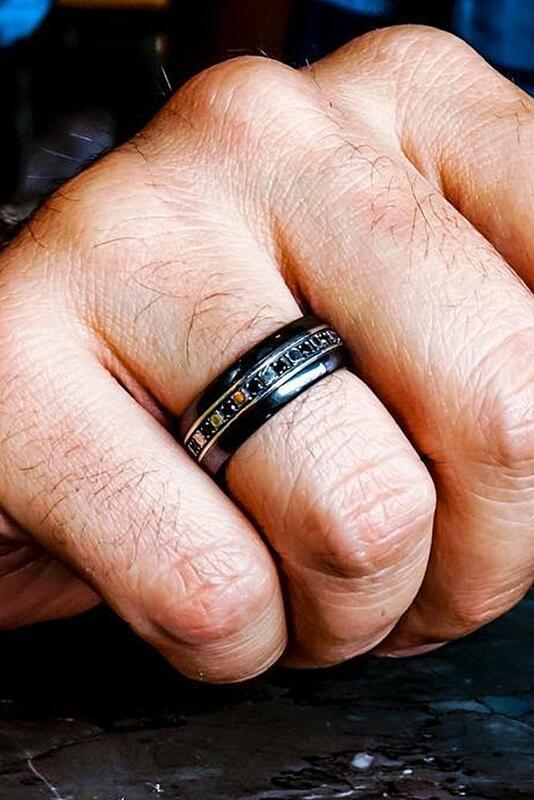 First of all, what can be better as a sign of everlasting love, than the ring made of one of the strongest metals on Earth? 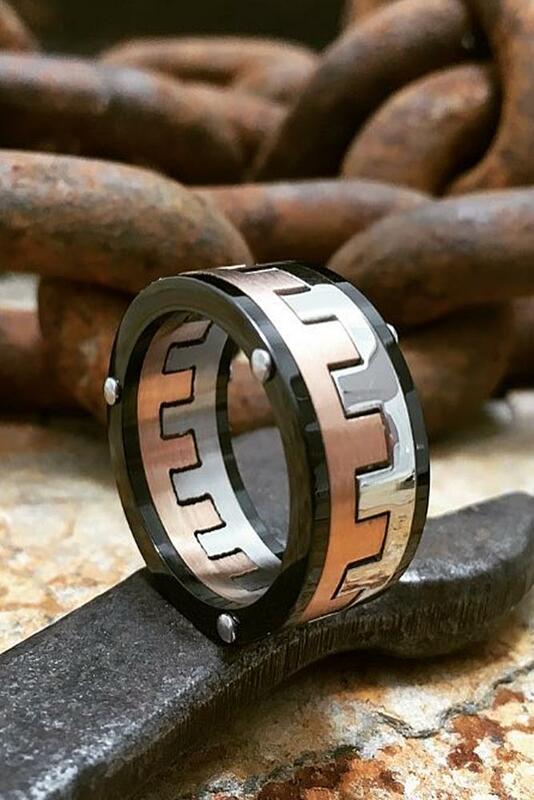 Tungsten carbide is harder than steel and titanium, and about 10 times harder than traditional wedding band metal – gold. 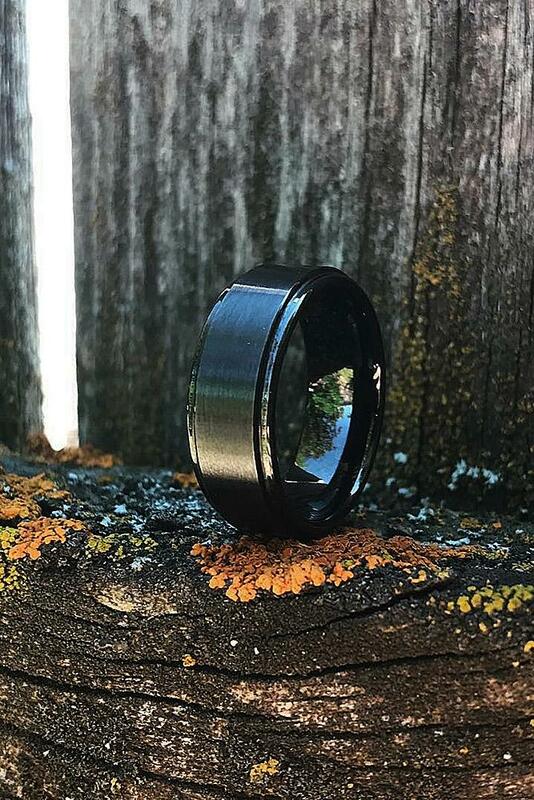 Which means you don’t need to worry about your ring getting scratched or harmed in any way. 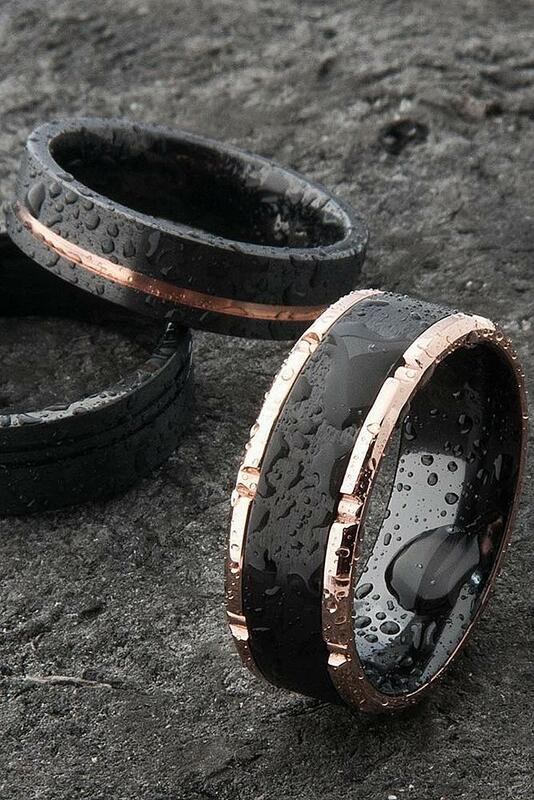 These rings are perfect for active men who have no desire to worry about their jewelry. 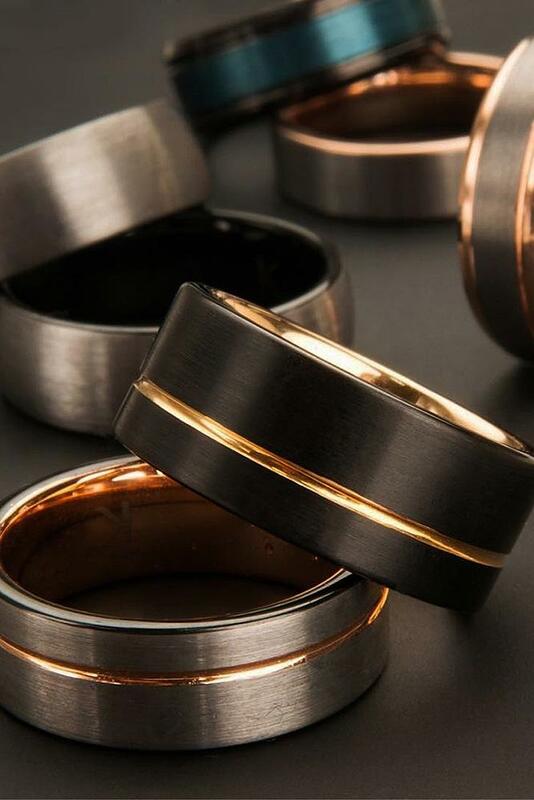 Another plus of tungsten bands is that they are much more affordable than traditional gold bands. It doesn’t matter which style you prefer – everyone will find something to please. 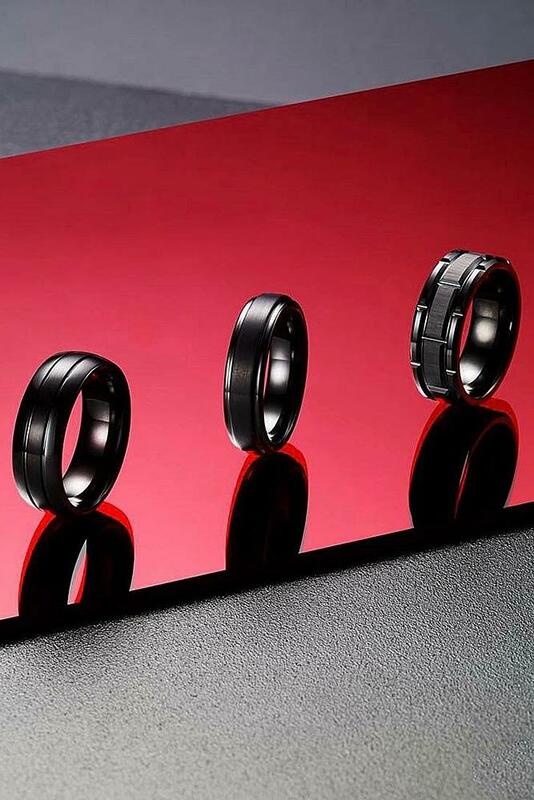 There are black rings and rings with channel set diamonds, rings with brushed layers and rings with unique elements. 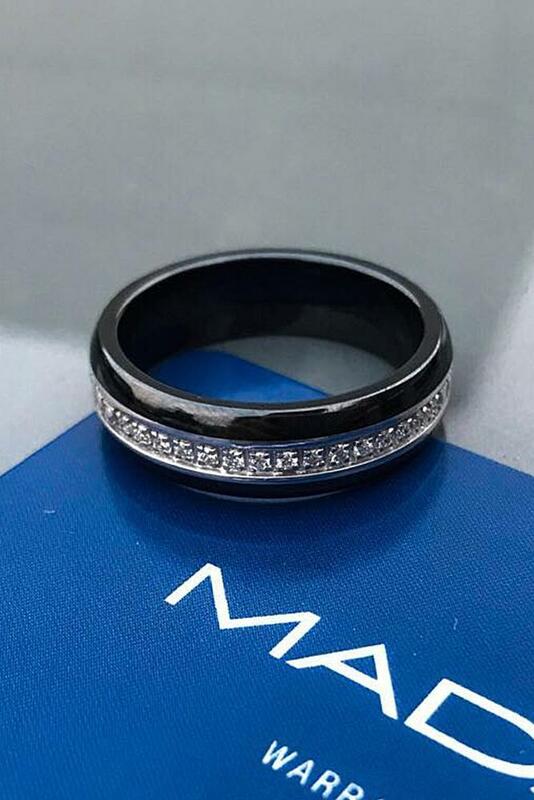 There are matte black or platinum white rings – the variety of choice is amazing! 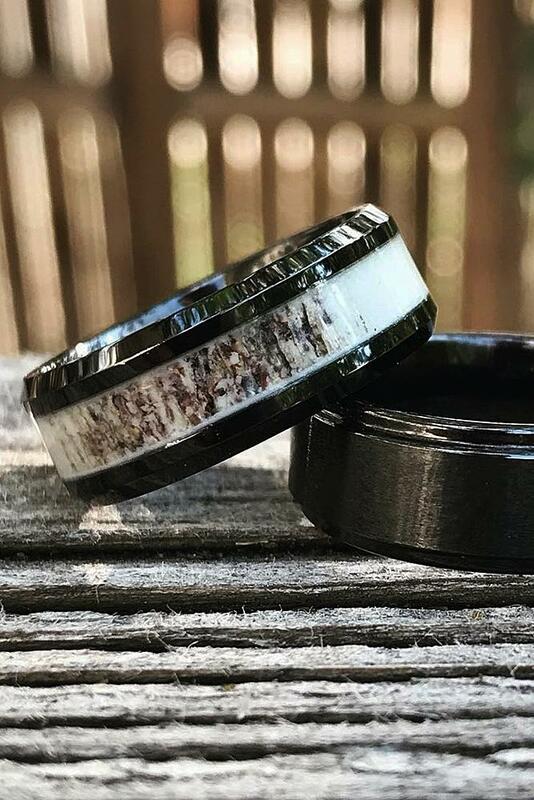 Many couples want to have matching bands. 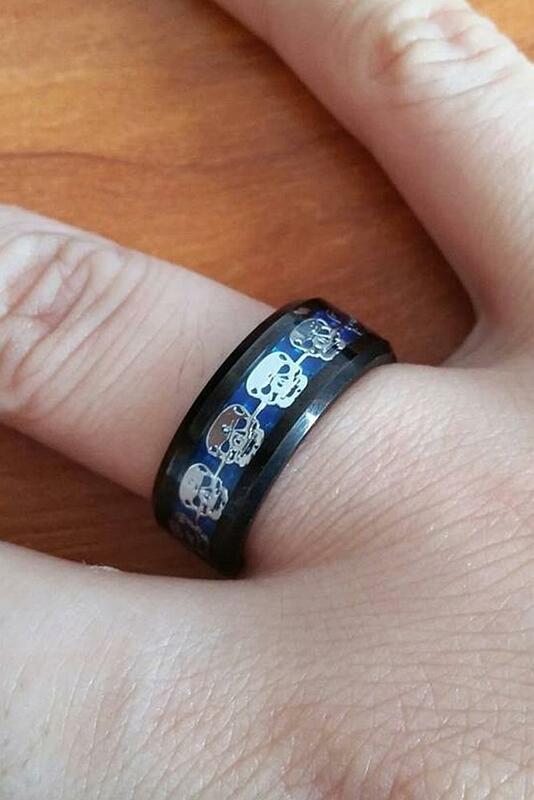 It doesn’t matter if you decide to choose a more traditional metal wedding band for her. 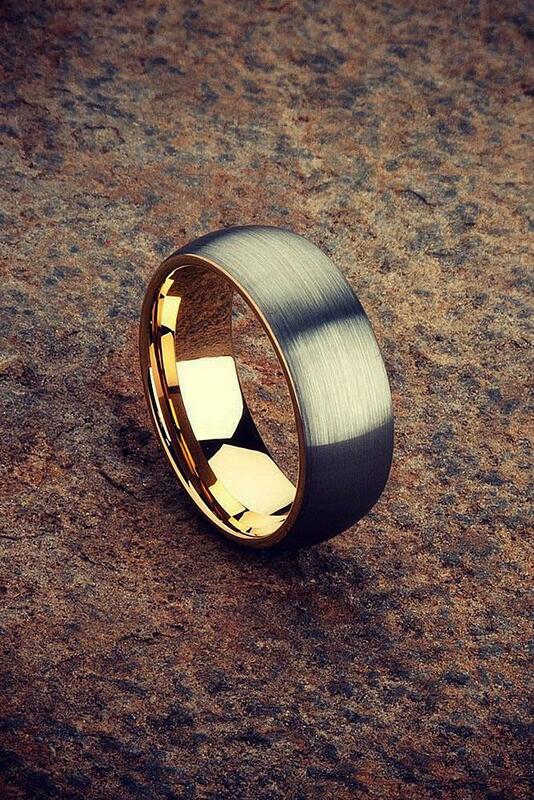 Just find one of tungsten wedding bands to match for yourself. 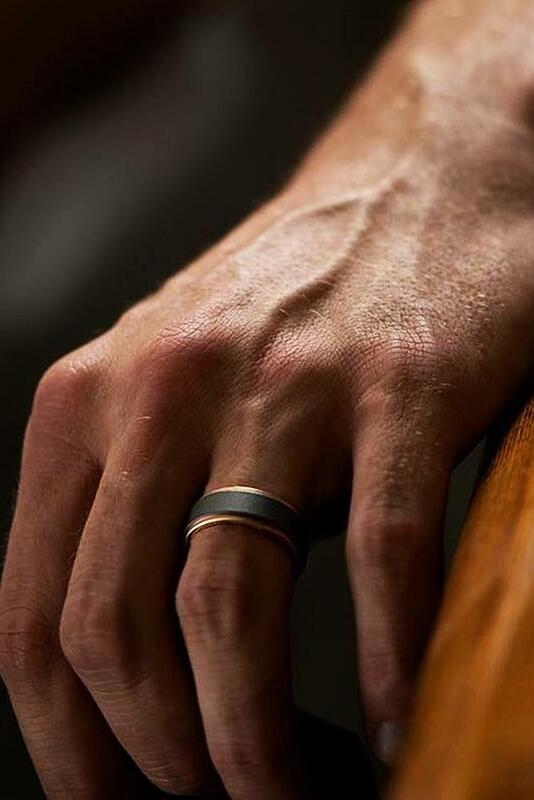 These bands are typically worn by men because they are strong enough to handle a lot of pressure. They are perfect for the work and exercise men do on a daily basis. Just make sure that your bands match in color. 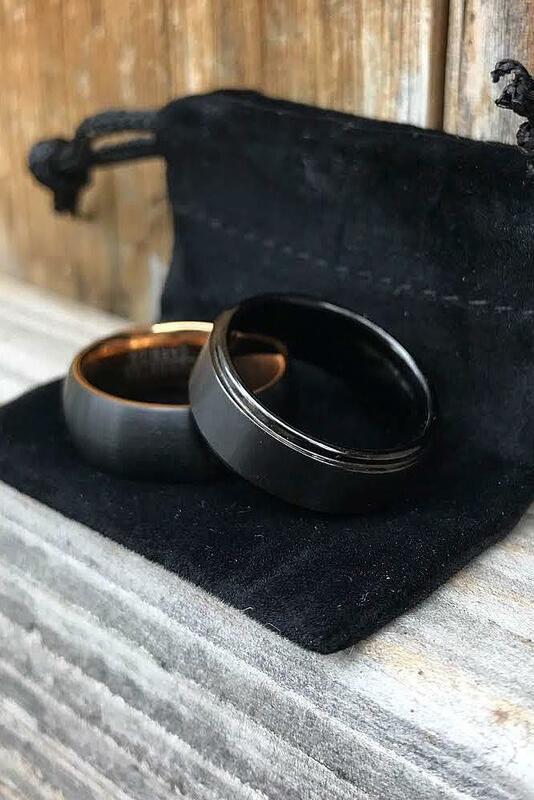 To make the connection between two bands even deeper you could make an engraving on both of the rings. 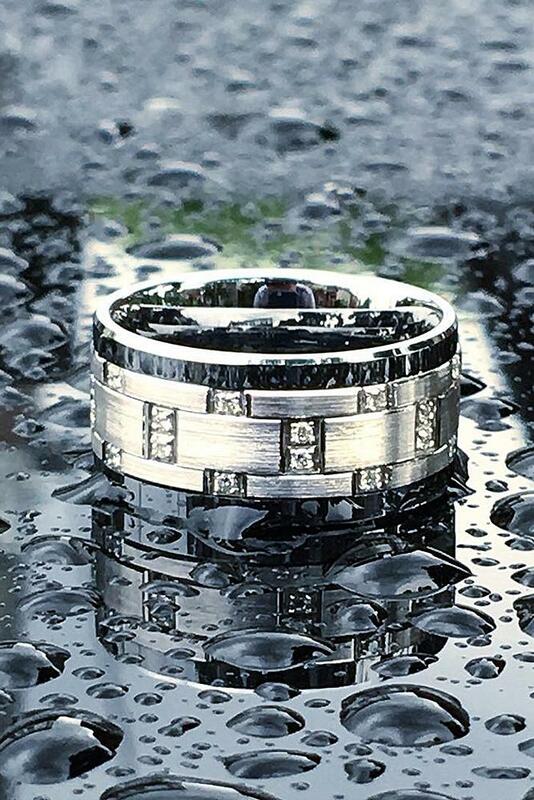 Channel set diamond rings add a flair of luxury to these durable rings. 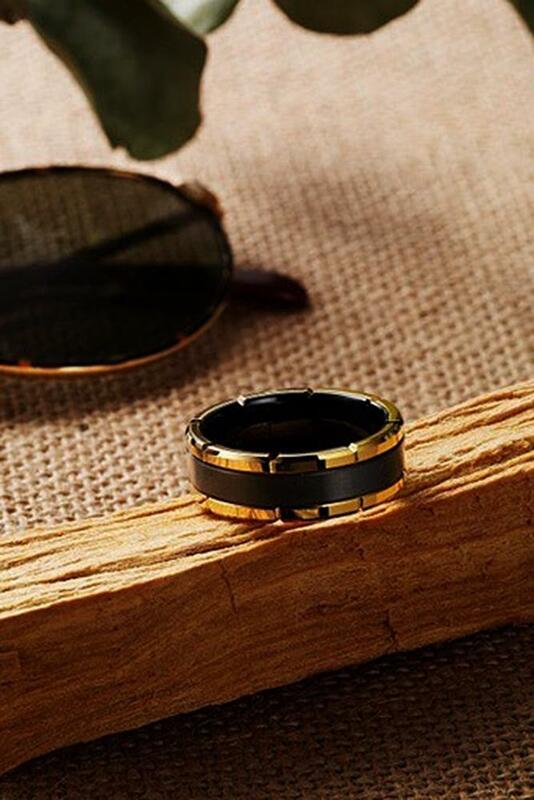 Black matte band will make you look modern and stylish. 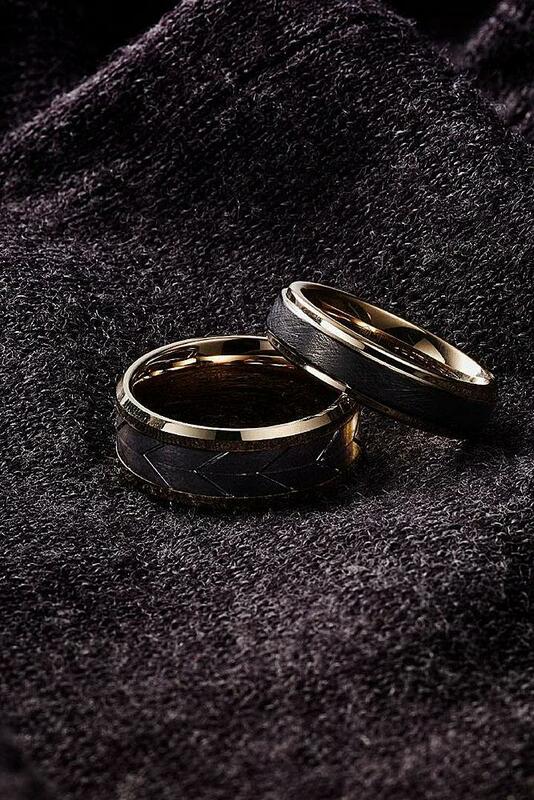 Are you looking for a traditionally-looking wedding band? 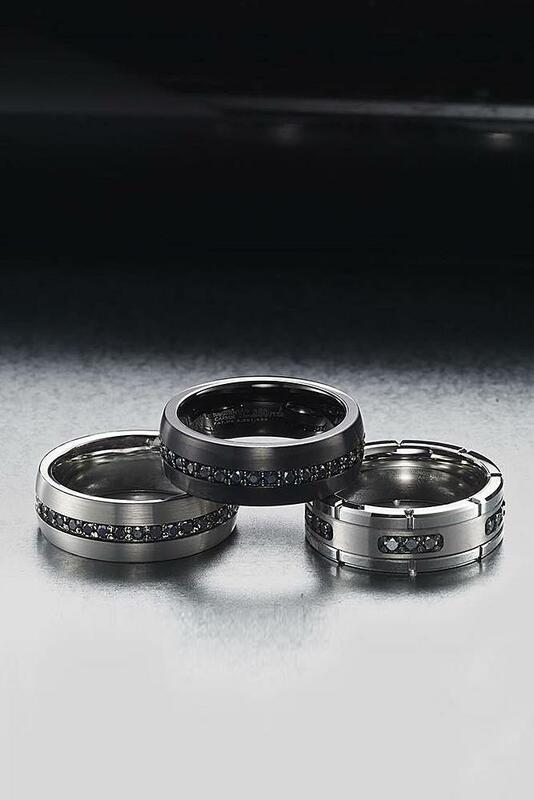 Try a white tungsten band the same color as platinum or white gold. Yellow tungsten bands remind of classical yellow-gold jewelry, while a pink tungsten bands look like pink gold. 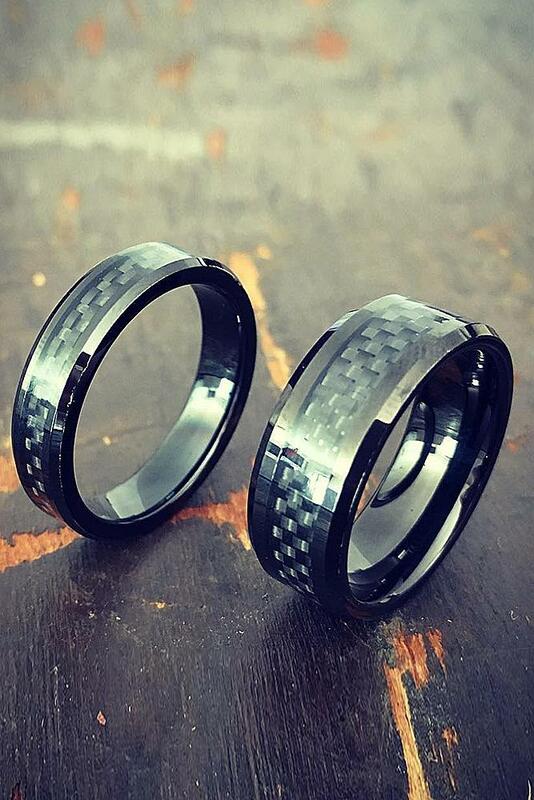 If you want something more colorful – try tungsten rings with shell inlay, or with a blue carbon inlay. You are an outdoor type of person, or plan a barn wedding? 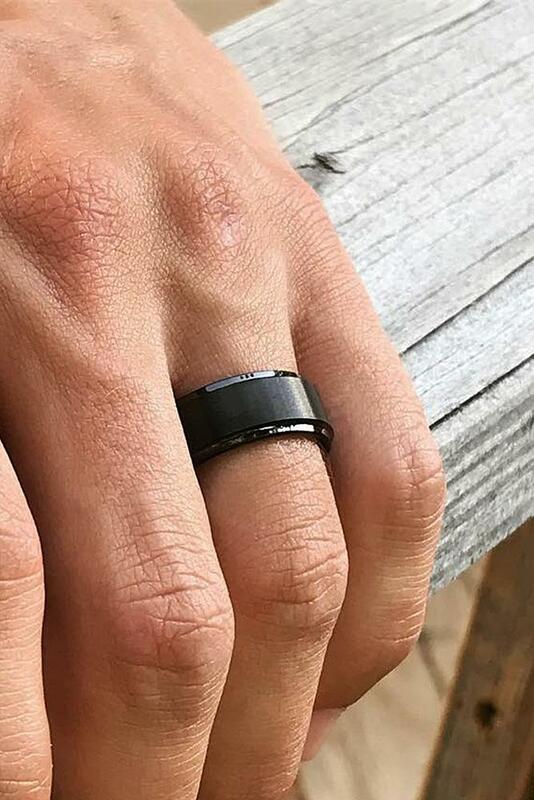 There is nothing better than a tungsten wedding band with a wood inlay. It would perfectly fit the spirit of a countryside wedding ceremony. 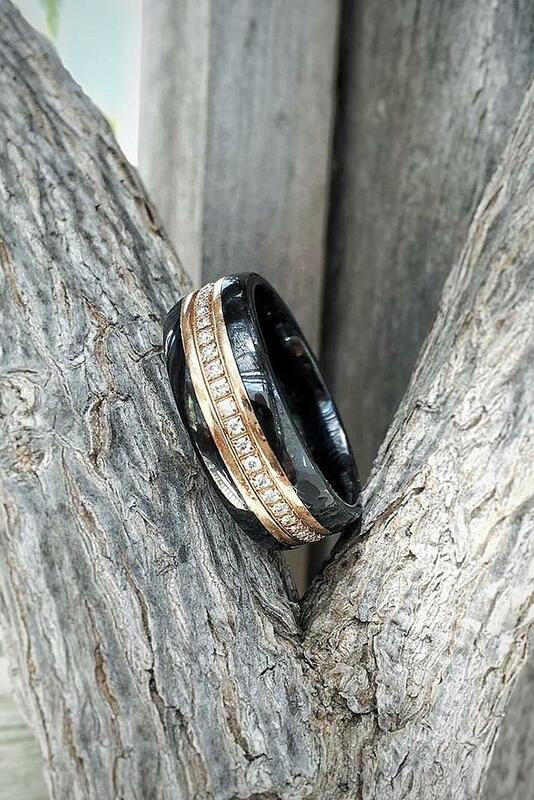 Such wedding bands are perfect for countryside or rustic weddings. 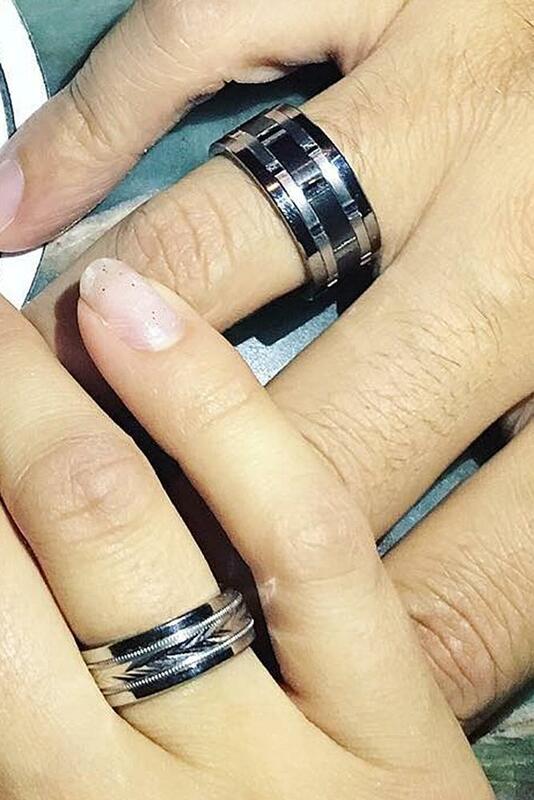 Anyway, as tungsten is a much stronger metal than gold or platinum, you need to be extra careful about the size. Changing the size of the ring will be a little more complicated. To choose the correct size, you need to keep in mind, that at the end of the day your fingers are larger. 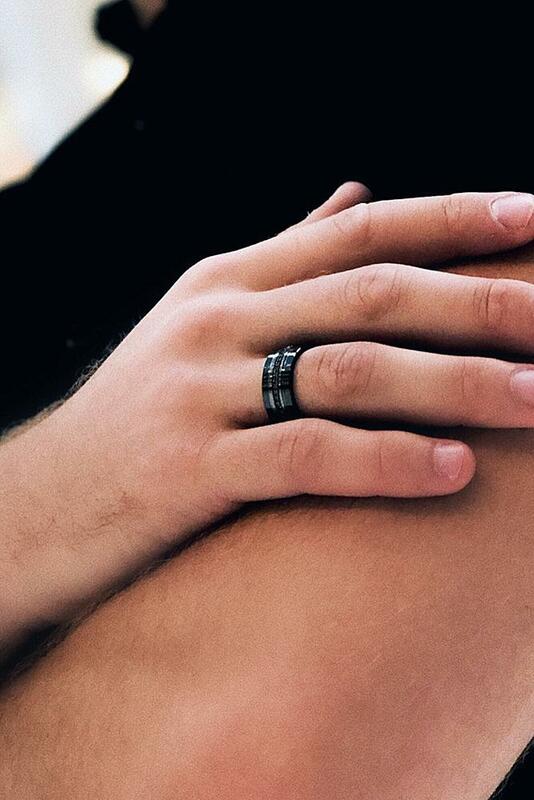 So if you want to make sure the ring fits, try it on in the evening. Another reason to avoid the final decision in the morning because this is the time when you retain water from the night before. 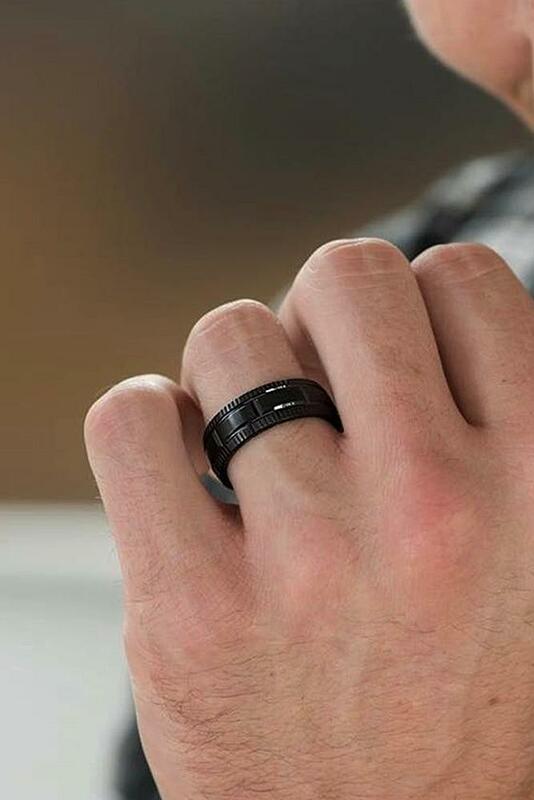 If you decide to order the ring online and want to learn your size by measuring your finger, allow enough room for the knuckle. Otherwise, the ring will get stuck. 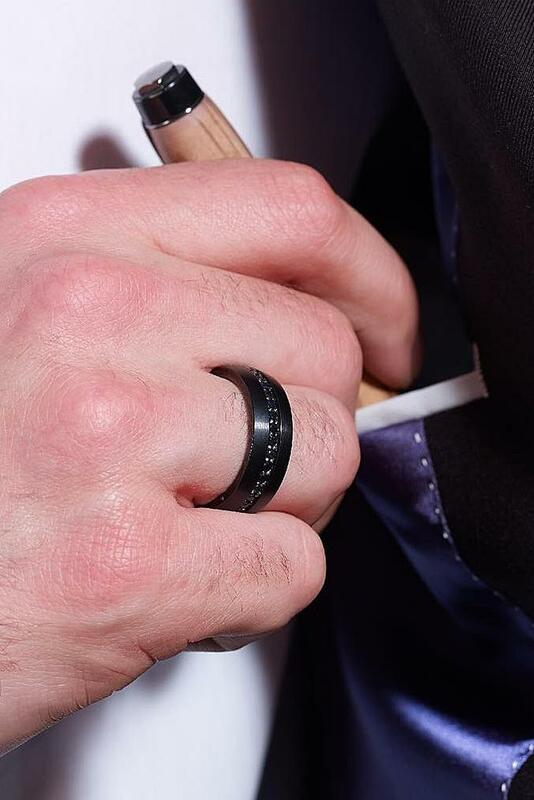 Also, measure the exact finger you are going to wear the ring. Fingers on the opposite hand often have different sizes. And fingers swell right after you’ve exercised, or when you’re extremely hot or cold. 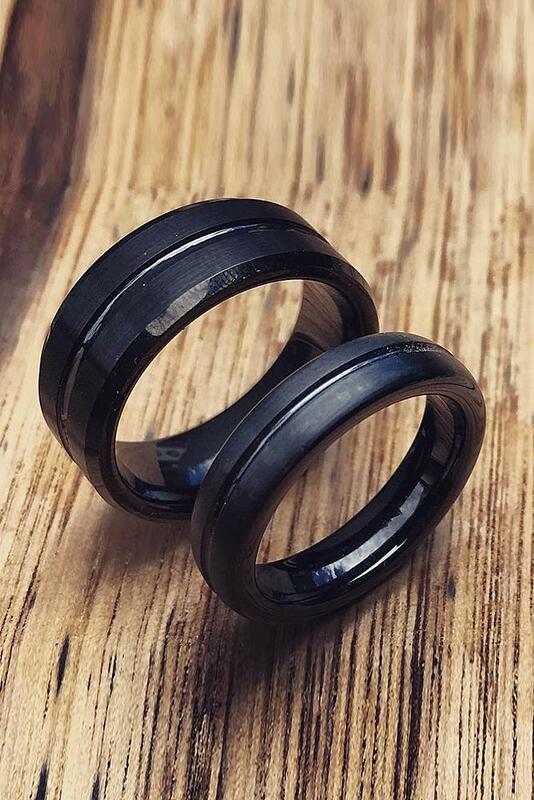 Tungsten rings are very durable, so you don’t need to worry about your lifestyle. 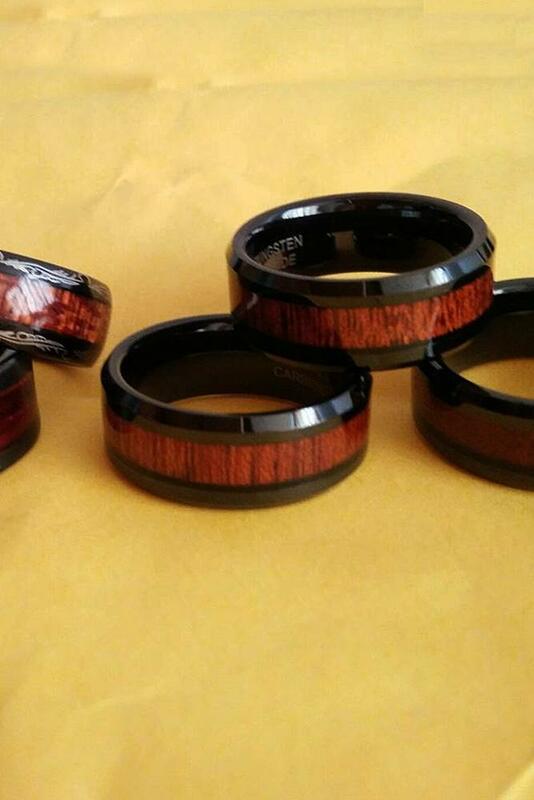 Anyway, if you play sports or an instrument, you might want a ring with rounded edges. Also, if you work with your hands, it seems like a really good idea to avoid gemstones or carvings. Gemstones might come loose, while carvings would simply trap dirt. 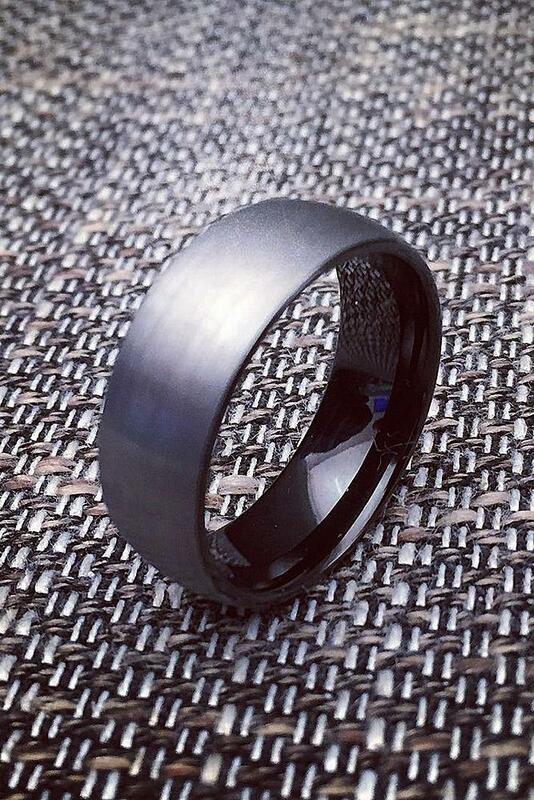 Don’t haste, take your time to choose, and find your best tungsten wedding band ever!